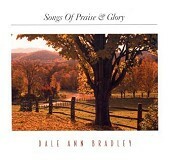 Dale Ann Bradley's voice is as uplifting and glorious as they come. Pretty and beautiful, it's majestic tone carries the words up to a higher plateau, making you not only feel, but live what she is singing. Add to that the instrumentation behind her voice and you have an instant winner. Soft, simmering bluegrass ripe for a Sunday morning listen while you have breakfast and look out the window to see the sun shining down on your face. I'll give it an A.